This week, I had some Photoshop fun with a photo of my friend Shaunna’s dining room. She told me she wanted to add some wood planks to the room, and that she’d love it if the planks were varying widths. That gave me an idea, but I told her to her to brace herself before I shared it with her, because it was a bit of a wacky one. “What about cladding it with some of that thin, 70’s lookin’ paneling they sell at home improvement stores?“, I (hesitantly) asked. But I mean, come on, if it was painted, it could look like this, right? And it would be an inexpensive way to clad just one wall, right? I love the increased sense of height those floor-to-ceiling vertical lines add to the room! I pretty much just wanted to show her what the paneled wall and the gallery lighting would look like, but I couldn’t help but sneak in some built-ins and a window seat while I was at it! And although the table and chairs probably aren’t anything like the table and chairs she’ll actually use, (I plucked those from PotteryBarn.com because they were positioned at the right angle for my drawing and pluckers can’t be choosers.) I did think it would be neat for her to see what using some kind of upholstered captains chairs would look like. Can’t wait to see what her and her handy hubby come up with! 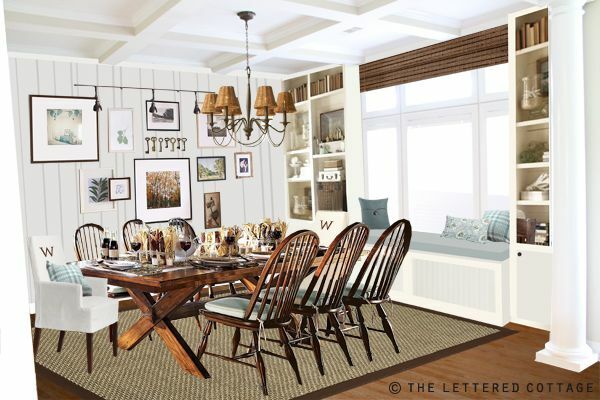 Need help laying out your dining room? My house is full of that paneling. Ick. I didn’t read all of the comments, so forgive me if this is a repeat, but I love the idea and the look! I wonder what it would look like if the panels were installed horizontally instead of vertically? Um, duh. I just realized that with 4×8 foot sheets, you’d have a big seam along the wall if you ran it horizontally. Scratch that silly idea! Fabulous ideas! !1 My daughter is just buying a house with paneling in the downstairs family room and we intend to paint it…wait till I show her these pics!!! I once lived in a 77 mobile home complete with harvest gold appliances, shag carpet and this paneling. I painted the paneling white thruout and did some designs in my kids rooms and most folks did not realize it was still the same old paneling but now with a farmhouse look. Of course the harvest gold everything got changed too. Outside still looked like an mobile home but the inside was “me”. I love your presto chang-o posts! Again, you didn’t disappoint! Love all of it! I was @ Lowes the other day browsing through a copy of the Flea Market magazine & spotted you!! Love seeing you in magazines!! It was a wonderful article! Love the look. Another great design. I have painted the 70’s fake paneling and the real stuff. I wouldn’t hesitate to do it again. 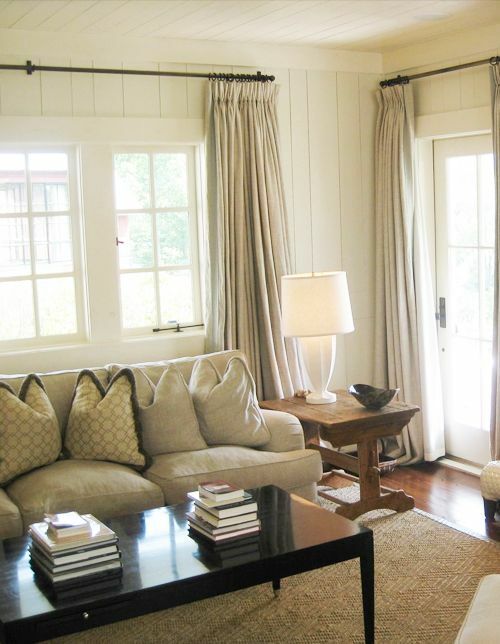 filing this one away – love the paneling idea … thanks for sharing your creativity & thriftiness! btw – any news on the barn door project? can’t wait! I may steal this for my kitchen! I’ve been trying to come up with some good “open up the room” ideas, and I think this may be it! Now Shaunna, if you get rid of that table, though, there might just be criminal charges involved. That is GORGEOUS! Looks heavy as all get-out, but too beautiful! My bedroom had that ugly brown paneling in it when we bought the house, and the first thing we did was paint it Navajo White by Porter Paints. I love the look of it. It doesn’t really show up very well in my pictures on my blog. I think it would look good “glazed” or something to make the “planks” show up better. Miss u and luv u! I suggested to Shaunna that she might want to paint the grooves with a slightly darker color first, then paint the rest of it with the lighter color. Maybe that would help bring them out a little more? Layla, what a truly fabulous idea with the paneling!! My mom painted her paneling in her house. The dining room got the white treatment…and actually when I was a kid…we painted it as a family. Then just this past year she painted the paneling in the paneling in her living room red. What a statement it makes! I’ve been longing to put wood planks (?? can’t think of the correct term I mean) in our home but have feared that when we sell, a buyer would love it. But now thinking of the paneling idea, that would be so easy for a buyer to change out if they didnt’ like it….esp if it was just a feature wall. You got my gears turning!!!! I’m wondering WHAT we were thinking back in 1986 when we added brown outdoor panels like that to the first house we built!… I hope the people who live there now read your blog and will paint them creamy white! Hi! I have a question re a previous post – on Shaunna’s eBook. I emailed her from her site, asking if the book could be printed (I want to give it to my sister as a gift, and she has no computer), and never heard back. I think it’s the perfect thing for her – of course not if I buy it and have no way to get it to her! If you can answer, or pass this question on to Shaunna, I’d appreciate it. Thanks! Yes! She now has a PDF version available…I’ll send her a message and let her know you’re interested in one! I just posted on your Facebook wall, I’ve painted cheap paneling and it works. I came here though HGTV, editors pick; birdbath sink. Clever! I didn’t know you write articles for HGTV. Good for you!! Recently, I was contacted by a journalist that writes articles for HGTV about helping her with a couple projects. So there is hope for the ugly paneling in my bf’s house. Now to convince him there’s hope for it. Please stop by our blog at http://www.theoldblockhouse.blogspot.com to enter our giveaway for six antique blue jars. Love the transformation! I have been looking for rattan or bamboo chandelier shades. Where did you find the ones you used in Shaunna’s dining room? Our basement is all painted paneling and I love it. It’s a basement so the ceiling is low, but the vertical panels make it feel higher. But don’t think you can only have white! When we moved it it was off white and it was fine, but I wanted a bigger color statement, so I painted it “Dolphin Gray” from Glidden which is a gray with purple undertones. It’s firmly in the purple family. It works so well. It was already painted in latex and we used latex satin and we’ve had no problems. We also inherited an aged drop ceiling. We can’t replace that right now, so we used a paint sprayer, took down the panels and painted them a creamy white and painted the metal grid. We did not prime. It looks fresh and clean. You don’t even notice it anymore. OK, WOW!!! I’ve used Photoshop for years and sometimes do a little Phtotoshop magic with my own rooms to help me visualize changes, but I’m nowhere near this good! You’re awesome! And I can tell you have fun doing it! Loved the redo. What colour white did your mom use on her paneling? Layla! I was watching my recorded episode of The Nate Berkus Show today and Shaunna was on House Proud. She was giving a home tour of her house and she got to her dining room and I totally recognized your Pick My Presto! Thank you for sharing all your ideas and tricks. I just had to let you know how amazing you are! LOVE this dining room. I realize you are a tad bit busy these days with your move but I was hoping that you might do a feature blog post on “cottage style” dining room tables. It’s such a big ticket price that you need to get it right the first time. 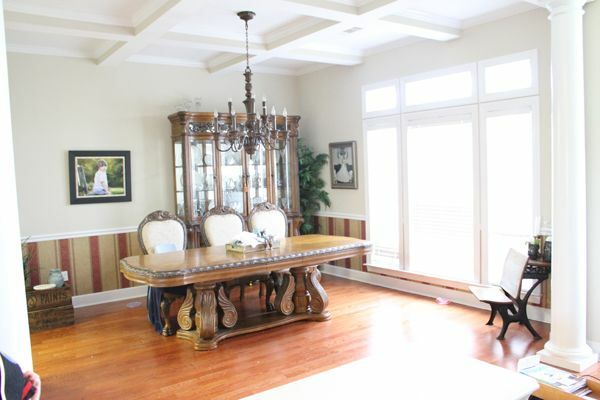 This request is spurred by our own family needs, but if time allows I would LOVE to read a post all about dining rooms. Thanks in advance!!!! And FYI the link to the other “Pick your presto” dining room is broken.